The first ten Janet Lamberts, or so. The world is slightly too much with me, so I am spending my August re-reading and writing about the books of Janet Lambert. In addition to the detailed posts on each novel, I'm updating this post as I make my way through the series. 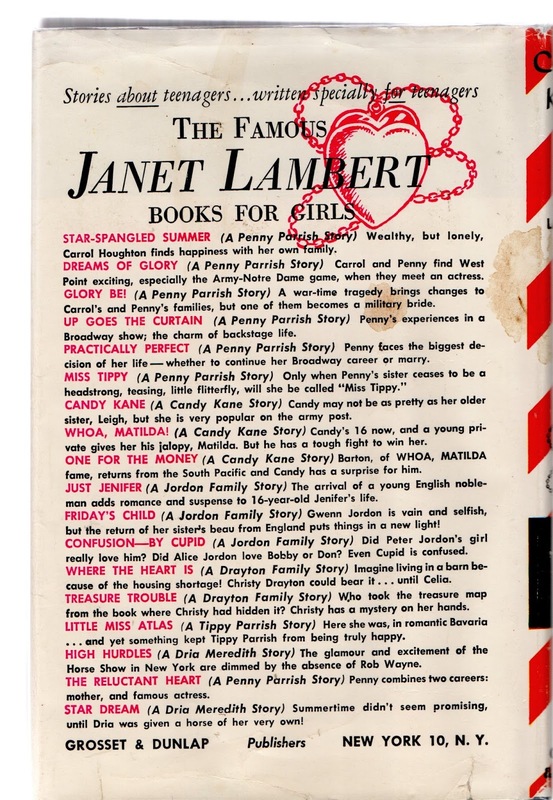 Although Janet Lambert has written a ton of books (Stories about teenagers...written specially for teenagers), her books about the Parrish, Jordon and the Kane families are the books I've loved since I was a child. Set (and written) during World War II and after, they encompass the world of the U.S. Army as well as the world of American Theater. What could be better? I recently filled in my collection, thanks to the lovely folks at Image Cascade, who reprint books from the 1930s through the 1960s, and I'm excited to finally read the entire series in order, or some semblance of order. The complication is that these sprawling novels focus on different families but feature characters from all of these families interacting. The Grosset and Dunlap editions have a locket on the spine with a number, but the numbering doesn't always make sense. So I'm going to do my best to keep it all organized--once and for all, with the help of this post. The series kicks off with Star-Spangled Summer (1941 - #1), which introduces us to the Parrish family: Major David Parrish, his wife Marjorie, son David, daughter Penny, youngest son Bobby and little daughter Tippy, bringing up the rear. The action starts when Penny brings Carrol Houghton out to Fort Arden, the army base where she lives with her family. We see army life through the eyes of poor little rich girl Carrol, who has lots of money, but very little love in her family. After seeing the example of the Parrishes, and with a bit of maneuvering by Penny, Carrol and her father are brought together at the end, and a romance is burgeoning between Carrol and David. 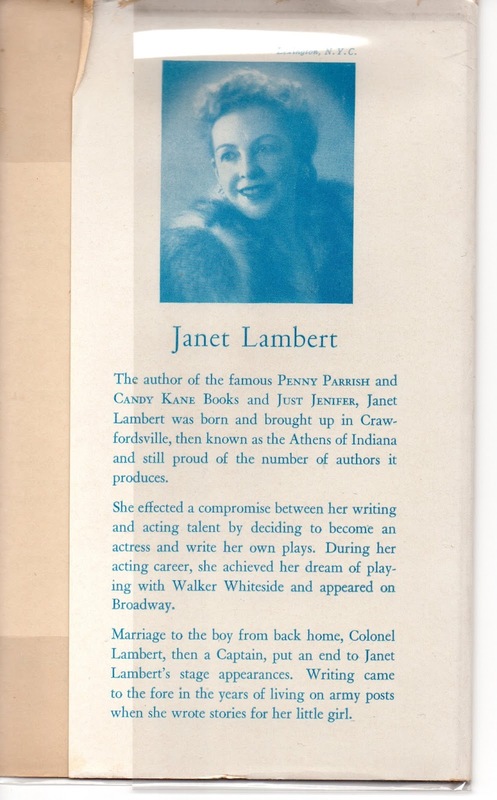 This is one of my very favorites, as it was the first Janet Lambert book I ever read. Although it was a Scholastic paperback reprinted in 1972, it was still substantially before my time. I was raised by two voracious readers, and we spent many happy Saturdays driving around to used bookstores. I can easily count the number of new books I bought as a child on one hand. It was all about the pre-owned, pre-loved books. New books just didn't seem right. Next, we have Dreams of Glory (1942 - #2), which picks up two months after the events of Star-Spangled Summer. Penny works on growing up, David goes off to West Point, not much else happens. It's not a favorite. But things pick up with Glory Be! (1943 - #3) which jumps forward in time about three years. Penny is turning 18, and ready to start her career on the stage, even if romance (in the form of handsome Lieutenant Hayes and loyal Michael Drayton) threatens to complicate things. David is near to graduating from West Point, and making plans with Carrol when they hear that the Japanese have bombed Pearl Harbor. Suddenly, everyone must prepare for war. Colonel Parrish goes to England for the war effort, and the family stays at Carrol's father palatial country estate, where her father is increasingly ill, and passes away fairly suddenly. David graduates, and Carrol and David marry as the book ends, on a lovely, tearful note. 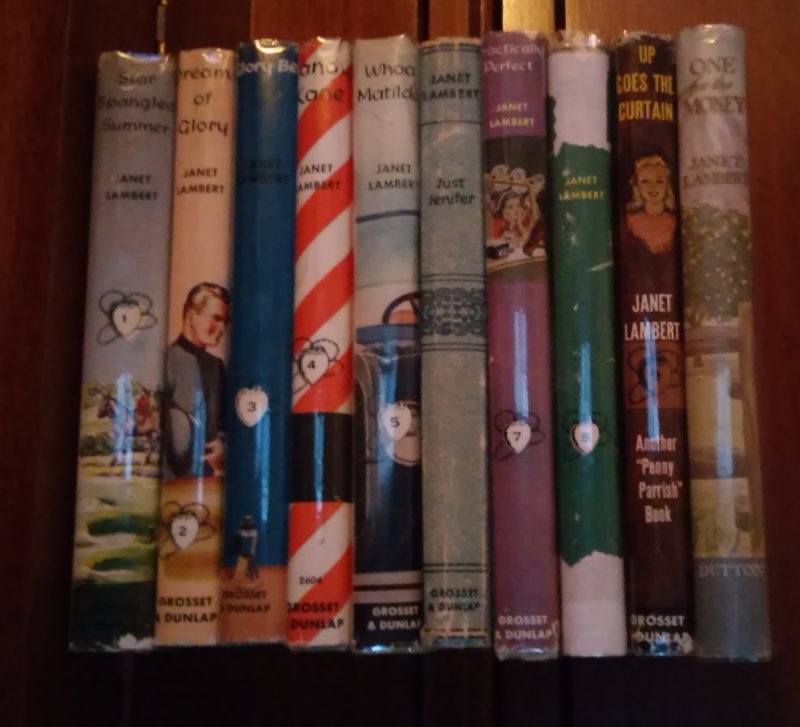 Now, although the order on my shelf says I should read another Penny Parrish, I am heading off to the books about Candy Kane (1943 - #4). Candy Kane is a whole new series about fourteen-year-old Candy Kane, who is new to Army life, and settles in beautifully on the base, despite her mother Marcia and sister Leigh, both of whom are pieces of work. She meets Barton Reed, the boy next door, and his whole family, and sings at an army show. It's adorable, and Candy Kane is a very endearing, sweet, awkward character. With the family adjusting to Army life, and the girl singer aspect, it's so quintessential World War II. Endearing and sweet and sincere. 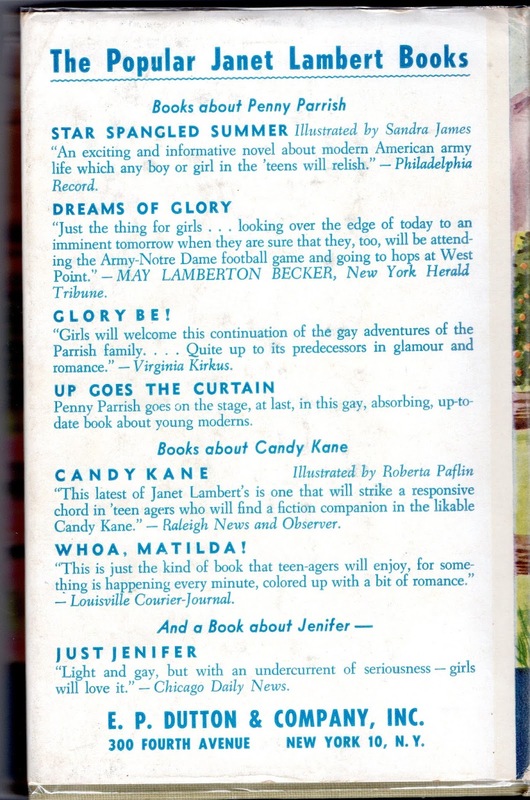 Next up, is Whoa, Matilda (1944 - #5), another novel about Candy Kane. This one picks up two years later, as Major Kane goes off to war, Barton enlists, Leigh is married to a soldier, and Candy goes off to sing on a war-bond drive. The family (which now includes friends Jane and Dirk) are faced with the realities of war, and must deal with wartime life with all its highs and lows. Another left turn. The next book in the locket series is Just Jenifer (1945 - #6), which introduces us to Janet Lambert's other massive army family--the Jordons. Sixteen-year-old Jenifer is left to mother her large family while her father General Jordon is fighting in Italy. Meanwhile, she meets British Cyril, sent over from England to live with his aunt after a family tragedy. Practically Perfect (1947 - #7) returns us to the Parrish family, where Penny is choosing between the theater, a home of her own, and love. Spoiler! She gets them all. A lovely post-war novel where we start to see the characters we met as teen-agers grow up, affected by war and life and love and family. Truly, Practically Perfect. Although, it does seem like we skipped a few years somewhere, as we find Penny already on stage and a great success. More on that later! But with the next novel, we return to the adventures of the Jordon family with Friday's Child (1947 - #8). Now living on Governors Island, the Jordon family (mostly Alice and Gwenn) meet the Parrish family (mostly in the form of Tippy and Bobby). Gwenn behaves like a brat, Alice struggles with her loyalty to Gwenn and her newfound independence, and as ever, Jenifer holds the whole family on her young shoulders. We meet up with Penny Parrish as well, who is starring on Broadway in a play and has a three-month old baby daughter. In keeping with following the locket order, I just read Up Goes the Curtain (1946 - #9). What the heck is up with these numbers? Up Goes the Curtain clearly goes before Practically Perfect, for she just gets on stage in Up and marries Josh in Practically. It's delightful, of course, but I've changed my mind about this locket order business. I picked up Where the Heart Is, a Christy Drayton book, but decided that life is too short for non-Parrish and Jordon stories. So I'm moving on to whatever is next for those crazy families. Stay tuned!